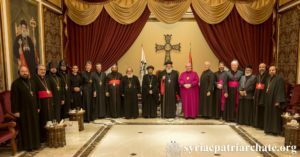 The Commission greatly appreciated the generous hospitality of His Holiness Mor Ignatius Aphrem II, Patriarch of Antioch and All the East, and the kindness of the sisters of the Mor Jacob Baradeus Convent, and all those assisting His Holiness. The Commission noted with deep sadness the recent passing of one of its founder-members and its former Oriental Orthodox Co-Chair, His Eminence Metropolitan Bishoy of Damietta. The Commission gave thanks for his contribution to Anglican–Oriental Orthodox relations, and for his leadership in the ecumenical movement. The Commission offered prayers for the repose of his soul, and continues to hold his diocese in its prayers. ‘monk, bishop, theologian, champion of the Orthodox faith and unity of the Church’. The members of the Commission welcome the unanimous elections, by its Oriental Orthodox members, of His Eminence Archbishop Angaelos of London as the new Oriental Orthodox Co-Chair and of the Very Revd Dr Roger Akhrass as the new Oriental Orthodox Co-Secretary. The Commission resumed its work on Authority in the Church, with papers on bishops and synods (councils), and the Ecumenical Councils. It seeks to draw on established ecumenical agreements in the framework of this Commission, and the distinctive characteristics of the two families of Churches. The Commission hopes to finalise and make available the fruits of its work on Ecumenical Councils in 2019. The Commission was received in audiences by His Holiness, Patriarch Mor Ignatius Aphrem II, Patriarch of Antioch and All the East, and His Holiness Catholicos Aram I of the Holy See of Cilicia, in which they both spoke about the present critical situation of Christians in the Middle East, particularly on difficulties in Iraq and Syria. The Commission was acutely mindful that its meeting took place in Lebanon, itself home to over a million of refugees from war and conflict in the region. The Commission holds before the wider oikumene the costly witness of the Churches in this country, offered in love and service to the dispossessed and the victims of war. The members of the Commission assured Their Holinesses that their prayers would be matched by concrete actions, visible support and solidarity on the part of their respective Churches. In particular, the urgent need for pastoral and ecumenical visits to Syria is vital at this time, and Churches in both families are strongly encouraged to respond in this way. Both Co-Chairs pledged themselves to facilitate such a visit in the near future, as a concrete sign of the faith, trust in and love and for the people who have remained in Syria, at considerable danger to themselves throughout the period of war. The Commission realises that its own theological work requires the practical expression of love as an outworking of the theological convergence already discerned around Christology and the Holy Spirit. Members of the Commission recognise that it is no longer a question of speaking of the Churches of ‘the East’ or of ‘the West’, as we have become truly global communities. Moreover, today we experience one another in different regional contexts and share together in Christian witness and civic engagement in a wide range of countries where Anglicans and Oriental Orthodox are living together. In the course of the meeting, members of the Commission had the opportunity to encounter local Christians, which included visits to the Monastery of St Maron, Annaya, where they were welcomed by the Abbot and brothers of the Lebanese Maronite Order, and to the Armenian Theological Seminary, Bikfaya, where students were introduced to the work of the Commission, and had the opportunity to ask questions about the Anglican tradition. The members of the Commission continue to hold in their prayers the two bishops of Aleppo abducted in April 2013, Metropolitan Mor Gregorios Youhanna Ibrahim of the Syriac Orthodox Church, and Metropolitan Boulos Yazigi of the Greek (Rüm) Orthodox Church of Antioch. At the conclusion of the meeting, the Commission thanks the Triune God, Father, Son, and Holy Spirit, for the mutual understanding and friendship that has been experienced and shared, and looks forward to continuing its work.